I began working with Virginia Woolf’s fiction writing in 2011. 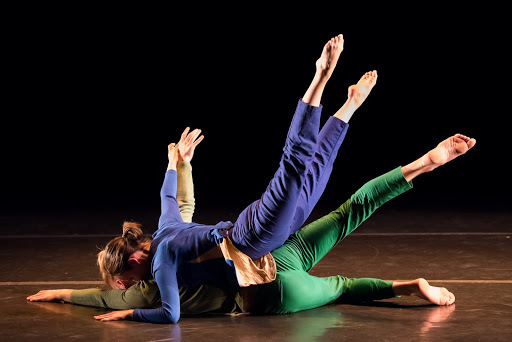 These dances are readings of Virginia Woolf’s fiction from an embodied choreographic perspective. In this project, Woolf’s writings become dramaturgical resources and choreographic propositions. Attending to her prosody, syntax, and formal structure, the dances are animated by Woolf’s written material without directly resembling it. The central method for my Woolf research is the generative practice of creating inventories of the objects and actions in her fiction. These inventories provide a point of departure far simpler than the overarching novel from which they were discerned. The inventories become the loci at which my work plainly overlaps with Woolf’s, and they truss my work to hers without the pressure of reproducing the narrative of the novel. I embed Woolf’s objects and actions into my own aesthetic logic, using the inventories to render my questions about structure and implicit feminist content visible. My research was guided by a provisional set of questions: How do we experience literature? How is a dance “read” by the spectator? To what does the designation “choreographic” refer? How does dance evocatively function without looking to language for substantiation? These questions were distilled into one: What does literature feel like from a choreographic perspective? Throughout the making of my Woolf works, I referenced her novels as both a dramaturgical resource and a choreographic proposition. My objective was to create an abstract dance work that related to the force and spirit of the original without explicitly resembling it. As a modernist writer, Woolf eschews representational narrative in favor of formal structure and rigorous devotion to the practice of composition itself. To the Lighthouse marks the emergence of this aesthetic, moving from narrative to experimental fiction writing. To the Lighthouse, though intensely formal in style, all but forgoes traditional expectations and previous delivery systems of the novel as form. Its circuitous poetic are accompanied by syntactical liberties: shifting in and out of the use of quotation marks in dialogue, employing sentences that last for pages, and leaving parentheses indefinitely open. Woolf “deliberately obliterates any suggestion of a single perceiver (Beer 39).” The alternating perspectives are so volatile and disorienting that the reader must surrender to the composition of the novel. Spurred by Woolf’s advice in this 1922 essay “Modern Fiction,” I became interested in the ordinary objects which appear in the book: a gold watch, a reddish brown stocking, a box of paintbrushes, a green shawl, a proliferation of dishware, and a litany of flower and bird monikers. These things appear as themselves, rather than acting as symbols of loftier meaning. In 2014, I created an inventory of all of these everyday objects that appear in To the Lighthouse, along with their frequencies of mention. The five hundred and ninety-four objects provide a high-definition lens through which to see Woolf’s consideration of ordinary life. Lisa Ruddick suggests that the repeated objects “acquire a variety of factual, verbal, conscious meanings which then become irreversibly combined in the reader’s mind. Each time the object reappears in the narrative it triggers simultaneously a multiplicity of associations (Ruddick 21).” Through these objects (like footholds in Woolf’s errant prose), we track the passing of time and the distinct, sometimes jarring rhythms of the characters’ lives. The object inventory allowed me to see To the Lighthouse pared down, reduced to a compendium of the original. Artist and critic Roger Fry, to whom Woolf was a closely affiliated through the Bloomsbury Group, calls for a new art in which the subject of a work of art is its composition alone, “cut[ting] out all the romantic overtones of life which are the usual bait by which men are induced to accept a work of art (Fry 10).” The dry and task-oriented experience of cataloguing To the Lighthouse brought repetition and proportion to the surface, clarifying my subsequent readings of the work. Taking inventory became a model for rendering my questions visible. In the summer of 2015 I created three new inventories from To the Lighthouse. The first was an account of color, which receives particular attention in all of Woolf’s fiction. I sought understanding of Woolf’s palette, a palette which I suspect, like many of Woolf’s compositional decisions, was extremely conscious. The dominant colors are blue, green, red and white. However, many of the characters have distinct sub-palettes. The second inventory concerned itself with the corporeal, taking stock of all the parts of the body mentioned in To the Lighthouse. Eyes and hands overwhelm the list, subtly indicating Woolf’s attunement to both the seen and the felt. The final inventory came about at the end of my preliminary research period. One primary concern for my dance was to avoid retelling the narrative of the novel—minimal though it may be. As in many of Woolf’s novels, the force of To the Lighthouse lies not in its story, but in the (now delicate, now severe) baring of the arcane inner lives of her characters: how they relate to one another, how they register the world. The majority of the novel does not take place in the present, existing instead in the characters’ recalling the past, imagining the future, or musing privately. I was led to a new question about To the Lighthouse: what actions actually occur in “real time”? I catalogued all of the particular actions that take place in real time, excluding the movement in the characters’ memories or imaginations. Most of the three hundred seventy-two entries can be subdivided into the following categories: advance, retreat, lower body, raise body, sit, stand, stop, walk, turn, touch, hold and look. The antithetical categories have relatively even numbers of actions (twenty entrances and nineteen exits; thirty-nine stands and thirty-five sits). In fact, looking at the complete inventory, a striking number of actions are balanced by a counter-action: knot and unknot, cover and uncover, brace and falter, open and shut. This inventory proved to be critical in developing the movement material which later figured into the building of Up with the Lark. The reverberating action, though so subtle that I did not initially include it, is “look”. With one hundred and thirty-six “looks,” the novel is a practical demand to behold things. As Lily Briscoe, the painter in To the Lighthouse, puts forth, “One wanted, she thought, dipping her brush deliberately, to be on a level with ordinary experience, to feel simply that’s a chair, that’s a table, and yet at the same time, It’s a miracle, it’s an ecstasy (202).” Woolf tempers her detailed, proximal observation with distance: Lily habitually steps away from her canvas to look across the bay to the lighthouse; the entire third section of the novel oscillates between two characters close to one another on the lawn and a distant sailing expedition. It is as if Woolf is prescribing a practice of looking closely at life, but occasionally stepping back and attempting to take the rest of the world in, though we can never catch it in complete sensory detail. This research underwent manifold adaptations as I shifted into the studio and began to create the dance itself. I was interested in adapting the force, texture and vision of the text into movement. I moved from traditional research to “movement research,” and finally translated my experience into the particular physicalities of the five dancers with whom I chose to work. Though I kept my catalogue close throughout the rehearsal period, I took care not to adhere dogmatically to it. The research and the dance were in constant, fluid relationship to one another, but they existed (and continue to exist) as two autonomous dimensions with common ancestry. 2014: “Jinny” Sketch, a solo I developed this from the first section of Woolf’s “The Waves” (1931) during a Groundwork Residency in Red Hook, Brooklyn. Barbie Diewald: “seven sundays” from Barbie Diewald on Vimeo. 2016: “Up with the Lark” relates to “To the Lighthouse,” particularly its colors and relatively small inventory of physical action. I had the opportunity focus on this research for my MFA thesis at Smith College. “Up With the Lark” 3 Minute Work Sample from Barbie Diewald on Vimeo. 2017: “Eighteen Refrains re: Rhoda” brought me back to Woolf’s experimental novel, “The Waves.” The book is given voice by 6 characters, and I chose to draw from Rhoda’s text alone. I started my research during five-week Bogliasco Fellowship residency in Liguria, Italy, and later developed it into a 30-minute work. Eighteen Refrains Re: Rhoda- Excerpts from Barbie Diewald on Vimeo.